I often get asked "How do you decide what to paint?" and that's a great question, but even better is one I don't hear often; "How do you decide how to paint that?" 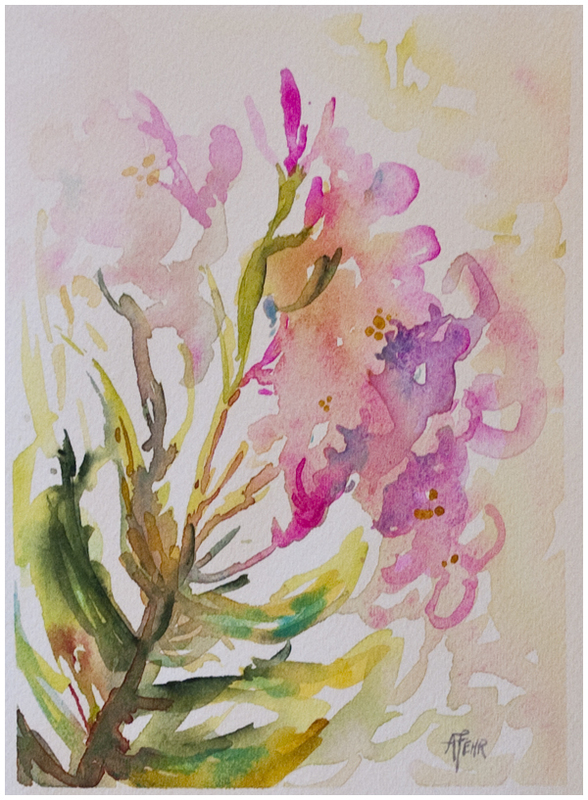 "Pink Oleander" available in my Etsy "Watercolor Sketchbook"
Interpretation is everything; it's where the magic happens. My goal, every time I'm in the studio, is to be guided by an inner vision, a sense of what the painting needs. This is made up of many things; 1. what pleases me (maybe a combination of brush strokes or favourite colours), 2. what the painting needs (strengthening the composition to create a dynamic painting), 3. what I want the outcome to be (a peaceful scene? a wintry barrenland? a sense of nostalgia? ), 4. what is actually happening on the paper (adding water and colour can be unpredictable!). It can be hard to tap into that inner sense and paint from the heart. Some days I don't feel it, I'm distracted, or trying a new subject, style or technique, or whatever. Other days it's almost immediate; this feeling that today it's going to happen and I can't put a stroke wrong. When that happens, sometimes I will even look back at a completed painting and not be able to remember the process of painting it, I was so engaged with the process. I feel that way about "Fragrant," shown below. This magic, the part interpretation plays in creating a painting, is what sets art apart from copywork. It excites me and has me eager to keep going, to try new things and watch for the "aha" of recognition when I suddenly can see exactly what is going to happen and how to take it there. When I am in the zone, I'm unstoppable. And it's not something that happens the first day you pick up a paintbrush. I struggled to learn technique for many years before I was able to trust myself and paint with confidence and learn to listen to my inner voice. It's the magic that makes it very hard to put a price on a painting, or for that matter, to sell it and let it leave the studio. Every painting is a testament to the truest part of myself, and that's why it's such a blessing to be able to be an artist, to share my work with the world and see others connect with something that is very personal and real. What the Heck is Giclee Printing?